My love of polymer clay started when I moved to New York State, USA in summer 2000. I had tried creating with polymer clay previously, but the brands available in the UK at the time were difficult to work with and took their toll on my poor little wrists! When I moved to the USA, I found a wonderful brand of clay that was easy to work with and readily available. I bought some clay, tools and a few starter books and set about learning the basics and creating my first few pieces. I was lucky to have many a close relative who oooed and aaahed at my first creations and gratefully accepted them as gifts. I was hooked. I moved back to the UK several years later with plenty of clay, ideas and experience! 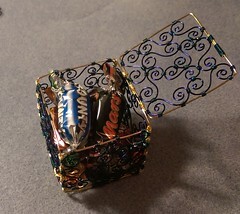 I have continued to work with polymer clay since, diversifying my ideas and skills. Through working with clay, I learnt the basics of jewellery making and branched out from there. I started with basic strung beadwork and then moved onto wirework. After joining a local beaders group a few years ago I quickly fell for the wonders of beadweaving and learnt other forms of jewellery making. 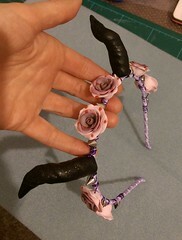 Whilst I continue to work with different forms of jewellery making, my main love is working with polymer clay. I offer a distinctive array of handmade polymer clay beads and ready to wear jewellery. I endeavour to create jewellery that is colourful and fun and most of all unique. I use an assortment of techniques when working with polymer clay including using millefiori, surface effects and using mixed media with clay. 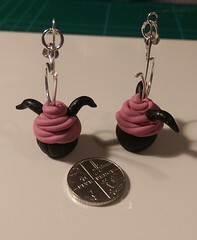 Where appropriate, I sand and buff all my polymer clay pieces to a lovely shine. In the instances where sanding would deteriorate a piece, such as with a textured surface, I will leave as they are or apply a coat of vanish.